My friends at Shop It To Me have a wonderful giveaway. They're giving away a Lucky Shops VIP gift bag worth $750! Inside you’ll find Amrita Singh bangles, Kiehl’s products, a Clu tanktop, tons of other fun beauty products and more. 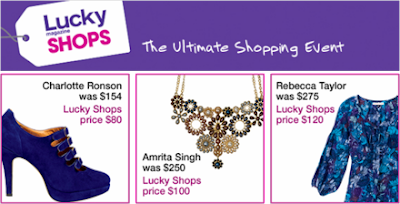 Learn more about the giveaway and enter here: http://blog.shopittome.com/2009/10/26/giveaway-lucky-shops-vip-giftbag-value-750/. You can also check out Lucky Shops to become familiar with the event. Too excited about that gift bag. I hope I win.....or at least one of my fabulous readers. Be sure to let me know okay :-) The drawing will be held Friday, October 30th at 5pm.